To do good work, one must first have good tools. But not too many tools, or really big tools, cheap tools, nor the wrong ones. 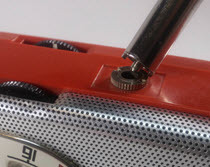 Nut Drivers Small-to-medium US and metric nut drivers are an essential part of any transistor radio repair bench. Again, assortments with holder/organizers are the way to go. Earphone Jack Nut Drivers These were once commonplace. Now they’re harder to find than--well, than gasoline for $0.25. Remember? You do? Me too. Anyhow, earphone nut drivers like the one on the right make it easy to remove those little spanner nuts on what else? Earphone jacks. You can make suitable substitutes by grinding the middles out of the right sized blade screwdrivers.I am in the process if manufacturing some new ones that will be available in my store. Sign up for the Store Newsletter to get a heads-up when they become available. Wire Cutters Purchase at least three and perhaps four high quality wire cutters—a really, really small one, probably spring loaded, a medium, and large one. If you do work on vintage car radios and stereos you might want an extra hefty sized on as well. Using wire cutters that are too small for the job will break them. 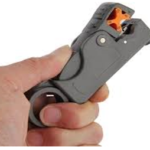 Big cutters won’t fit into the tight corners of small radios. Spring for three or four good wire cutters. Needle Nose Pliers Again small, medium and large. Perhaps one with a bend in the tip for those really tight places. Cheap ones will become useless in a half-hour. 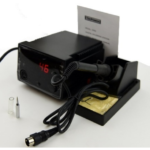 Desoldering Iron Of the many options available for removing solder I like plug-in irons with the sucker like the one below. Get one at Amazon for under $15.00 or look elsewhere online for ones that cost slightly less.It’s nice, but not necessary to get one with replaceable tips. A holder is nice too since they get really hot. I also use a ceramic tile underneath mine. The tile also safely catches solder dribble. 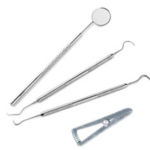 Dental Tools and Tweezers Find an assortment of dental picks to clean out solder holes in circuit boards. A good pair of tweezers or two to helps retrieve little parts from out of the way places. Heat Sinks While not absolutely necessary an assortment of heat sinks like the one shown here can help protect fragile components when you solder and unsolder them. They are particularly helpful when you are just learning how to solder. Third Hands I swear that, between airport security and hobbies, humankind will evolve into creatures with three hands. Until then people will make money selling them to us. This one sells for less than $30 on Amazon. 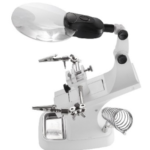 It lights and magnifies as well as holding things steady while we work. I use mine nearly every day now. 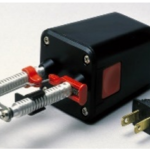 The magnifying feature is perfect for reading the small print on components. The holders are much steadier than any boomer’s hands. Wire Strippers Removing the insulation from wires, especially tiny wires can be tricky. It’s important not to nick the conductor in the process. My favorite wire stripper is the electric one shown here. It heats the insulation so that you can easily pull it away. Non-heated strippers are much cheaper, but harder to use. 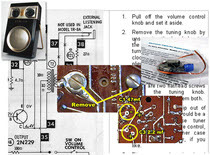 It's easy to nick or otherwise damage the small, delicate wire found in vintage transistor sets. Coax Tools If you will be making your own test equipment cable or working on Ham and CB gear, add a coax stripper to the tool collection. Perhaps one of mankind’s most helpful inventions. The one here can be purchased for less than $5.00. 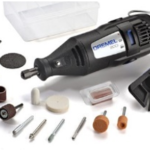 Dremel Set If the budget permits, go for it. Basic plug-in kits like this one for under $50.00. Rechargeable battery motors can double the price. You can find these online, or even at Target. 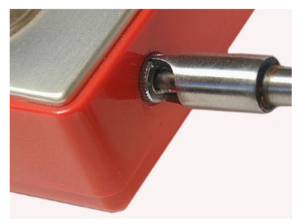 They make short work of such tough tasks as removing corrosion from abused battery terminals. Avoid the temptation to use the cloth wheels that come with these for plastic polishing. Chances are you will melt your radios. Cleaning Tools Round up a collection of soft rags, sponges and a toothbrush or two. A camelhair cleaning brush or two will come in handy too. 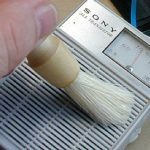 I discuss sandpaper, polish and other abrasives in the plastic and metal restorations of the site.. They are part of the cleaning process as well.Don’t forget rubber gloves and eye protection.Again, using a separate cleaning station can help prevent accidental damage to vulnerable plastic. Keep sandpaper, abrasive cleaners and other contaminants off of the electronics bench if possible.